So I received my first Christmas present last night! My dad and I met up for dinner at Across the Street (mmm tvp tacos! and sangria!) and a mini-shopping spree at Cosmo’s Vegan Shoppe last nigh,t and I walked away with a bag full of goodies. Hurrah for being vegan and having vegan-specific stores in town! At the bake-off on Sunday, a bag from Queen Bee Creations in Portland caught my eye. Originally $98 but marked down to $76, I knew that if the chance arose I was going to nab it. My original bigger bag that I use for school grew a hole in it, so I figured I better replace it before my keys fell out. 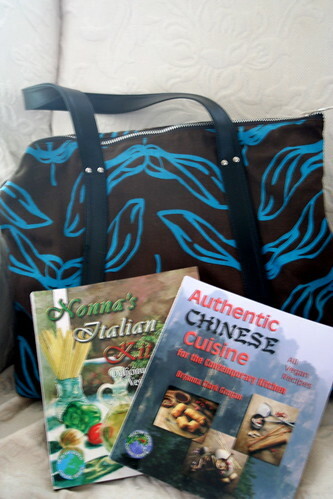 I also grabbed a copies of Bryana’s Nonna’s Italian Kitchen and Authentic Chinese Cuisine for the Contemporary Kitchen. I stir-fry a lot and I normally find my recipes online, but having sauces and mock-meat recipes in one place is going to be great. I haven’t decided what to make first–sizzling rice soup, kung pao chicken, beef and broccoli–it all looks so fabulously good. Chinese cuisine is definitely one of my favorites. I’m also excited about the Italian one because I’ve wanted an excuse to buy a pasta maker. Homemade tortellini or ravioli? Yes yes yes please. I miss Italian food so much–not the cheeses, but the pasta choices. Occasionally I end up at Figo, an Italian chain, and while I’ve learned that I can substitute meat from the sauces, I’m still stuck with penne pasta and a rather bland tomato sauce. Have I mentioned that I love stuffed pasta? I can’t wait to try any of these recipes out. Now on to the recipe I promised. I have I whetted your appetite yet? Have I teased your tongues? Well here’s the first installment! Like many of you, I ran across Leite’s Culinaria’s recipe for Caldo Verde, a traditional Portuguese soup. Last week, a beautiful bunch of kale came in my vegetable husband basket, and with the weather being so dreadfully cold for the South (it’s all relative, I know), I decided that nothing sounded better than kale soup. One problem though. Arguably, the main component of the dish is a hard sausage. But I was determined to make this dish. I did a few Google searches to see if anyone else had perfected vegan chourico, and Bryanna actually had one online! Unfortunately, her recipe was for a loose tvp crumbles and the soup required a hard sausage. While I normally don’t go out on a limb and veganize savory dishes (I’m truly more creative as a baker), I figured I could take Bryanna’s seasoning mixture and create my own saussage a la Julie Hasson. The end result? The most delicious vegan sausage I’ve made to date. The poet agrees. Don’t be dissuaded by the incredibly long ingredient list–this is worth it. Plus the steaming method takes only 30 minutes, so you’ll have your saussages in no time. Stay tuned for the next two pieces of the recipe! In a large bowl, mix together all of the dry ingredients. In a seperate bowl, whisk together the liquid smoke, red wine vinegar, soy sauce, olive oil, and water. Stir the wet ingredients into the dry ingredients until combined. Knead the dough for a minute to make sure everything is mixed, and then let the dough sit for 5 minutes. Scoop 1/2 cup dough mixture at a time and shape into logs. Place logs on piece of aluminum foil and roll up, twisting ends. Place sausages in steamer and steam on medium heat for 30 minutes. Remove sausages from steamer to cool. Once they are cool, remove the aluminum foil and refrigerate until ready to eat. Your sausage looks very delicious! I wish I had liquid smoke to make this. Yooupie for sweet holiday Daddy shopping! Very sweet scores – and I’ll have to try that sausage recipe!! Now bring on the soup! Yum! You can bake them, too, and you don’t have to use liquid smoke – we use something called Bakon Yeast, and it’s way good stuff! my oh my. i was planning on making sausages tonight, and maybe i’ll switch over to this recipe instead. i wonder if i can just used a couple grated garlic cloves instead of powder? and also if i use veggie broth instead of water, can i take out the veggie flavor powder stuff? i’m sure it’ll be fine, those are pretty small substitutions. thanks for the awesomeness! I’ve still never made vegan sausages, nor eaten them in the first place, but these do sound pretty good… Maybe it’s time to try this! Yay for vegan chorizo! I love Julie’s method for making seitan sausage. It always turns out perfectly. That bag you bought is gorgeous! I’ve been wanting that chinese book forever! You’ll have to let us know how amazingly good everything tastes, and then I will be that much more tempted to press the Go To Cart button at amazon. Oh, cookbook addiction! But seriously, I’ve been aghast at my inability to make chinese food lately, it’s for the greater good. You better believe I’m trying this asap. I’ve been all about the seitan recently! hey! i made this last night and it was WONDERFUL! so easy, too. boyfriend declared it the best sausage i’ve ever made, which is big because he’s nuts over the other recipe i use. everyone, go make it! YAY for such an awesome early Christmas present!! 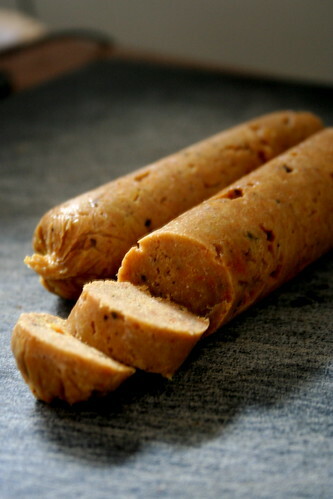 I’ve been wanting to make my own vegan sausages for so long but I’m too lazy! Thanks for the recipe, your picture looks so artistic! Oh my heck….you have no idea how much I need this. I recently went vegan and being have Portuguese, this is one of the things I was going to miss the most….not anymore….thank you thank you thank you.